LIMITED FIRST EDITION version of the GS 12 C and GS 15 C.
Only 20 units per country. 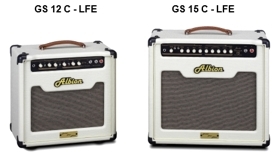 Each combo features basket weave creamy white vinyl covering, LFE badging, and a Certificate signed by Steve Grindrod, the noted “VALVE AMP GURU” who will also be inspecting and testing each combo when it is produced. Each certificate shows the serial number denoting the time and date of manufacture making the LFE Series collector pieces which in time will become priceless collectibles a guitarist heirloom.